Here are step by step instructions of how to apply GuitarPlayerNails. The basics of these instructions apply to all of our nails. Even though we put a lot of information in our instructions here, (we wanted to cover as much detail as possible), it's actually a fast and simple process. Once you gain a bit of experience, you'll be able to remove an old nail and put on a new one in about 5 minutes. If you're new to using our nails, we recommend that you start with our pre-formed nails. Please go to our Helpful Tips Page under "Using Our Pre-formed" Nails for more info. These instructions show the application of our Instant Nail in detail. These techniques are used with our other nails as well. With our pre-formed nails, you can skip steps 1 thru 8. Please also watch our instructional video here. The Instant Nail II has a slightly textured side, and a smooth finish side. This nail should be applied with the textured side down.The textured side of the strip is what will be glued to your nail plate. The Instant Nail llX, should be also be applied with the textured side down. The Instant Nail CLX can be applied either side down. 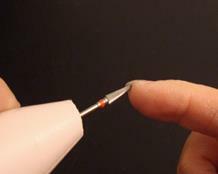 The Instant Nail ll uses the regular manicure sick to create the shape of the nail. We include one with each order, and in our kit. The Instant Nail llX, and the Instant Nail CLX use the larger 1/4" dowel to create the shape. We include one with each order, and in our kit. 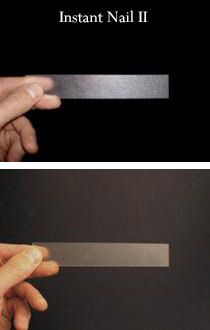 For extra adhesion, you can rough up the material a bit with a medium grit file before application. The first step is to cut yourself a piece of the Instant Nail material a bit longer than needed, and a bit wider than your nail. Instant nails, and all of our nails should be applied to only a bit more than 1/2, to 3/4 your nail plate. The length will be determined by measuring from approximately that point on your nail. Natural nails should be kept short, (not painfully so), a bit of free nail can be present. 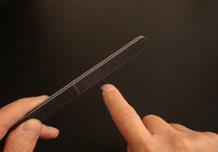 Measure the Instant Nail against your nail. Bend the Instant Nail a bit to the contour of your nail while doing so. 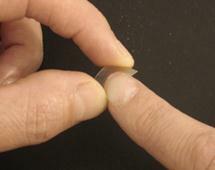 Cut off any excess material a little bit at a time until it's the same width as your nail. If you cut off a bit too much, that's fine. Just make sure the short side is on the right (pinky) side of your nail plate. Next you want to put a curve in the Instant Nail that will match the curve of your natural nail. To do this, press the Instant Nail against the manicure stick, and then while squeezing the nail against the stick, roll it back and forth from side to side to create the curve. If you're using our "Instant Nail llX" or "CLX", use the larger diameter dowel we include along with these nails. (See video clip here). Make sure that the curve of the Instant Nail matches the shape of your natural nail as close as possible. Make sure to flatten out the middle of the Guitarplayernail to match your natural nail and to avoid "tenting". Do any final adjusting with your fingers to match the curve of your nail as close as possible. 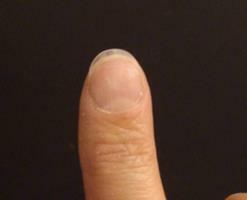 You can hold your nail pointing away at eye level (like aiming down a gun barrel) and dry fit the nail before applying. Make sure there's no "tenting" in the middle of the nail, and that the nail can lie flat against your nail plate with no gaps in the middle of the nail. Next, get some glue into a pipette. 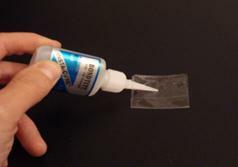 To do this, dispense a good size drop of thin super glue on a non-porous surface. Then squeeze the pipette, and siphon in the glue. (Once glue is in a pipette it will have a limited shelf life. Usually about a week or two). If your natural nail is too thin or sensitive at all, it should be built up a bit before applying our nails. Best way to do this is with some nail glue, and some nail glue dryer. Simply apply the nail glue over at least 1/2 the natural nail, then spray with nail glue dryer. Make sure to wash the natural nail and buff it with a fine grit file or sandpaper before applying the guitarplayernail, this will stop the nail glue dryer from continuing to work during nail application. If using thin glue, don't apply it too thick if you're using nail glue dryer with it. This will build up heat. Use a thin coat at a time. Dry fit the Instant Nail. You're going to apply all of our nails to only about 1/2 to 3/4 of the nail plate. That's all you need for good adherence. The nail should lay flat at the front part of your natural nail. Apply so that there is no gap at the front of the nail. 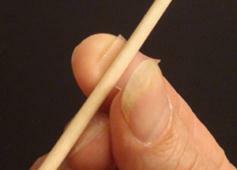 Apply a thin layer of glue to the front, center of your natural nail. Don't apply the glue all the way to the edge, as the glue will spread out a bit when you apply the nail. At this point your objective is to establish the proper angle and to set the nail at this angle. Apply the nail so that there is no gap at the front of the nail. Apply the Instant Nail, and hold down for several seconds, to up to a minute or so, depending on how much glue you used and other factors. Apply pressure to the front, middle part of the nail at first, and then work your way back a bit. You can hold with medium pressure. Hold until it sets. If you have any problems with adhesion, or if you'd like quicker adhesion, you can spray the Instant Nail with a small amount of nail glue dryer before application. (Don't spray your natural nail). You can also rough up the nail a bit with a medium grit file. After that sets, you can glue down the rest of the nail by "back filling". See a clip of back filling here. While gluing the nail, hold your finger down, vertically (pointing at the floor), so you have gravity on your side. You can glue one side at a time. Using one of our pipettes, or a small diameter extender tip, dispense some thin nail glue behind the nail, and then hold to set. You only want to dispense a small amount of glue at a time, especially if using nail glue dryer, as it can build up heat. So just add a little bit at a time when back filling. 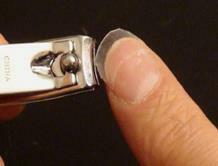 Hold the guitarplayernail lightly against your natural nail with a free finger as you apply the nail glue. 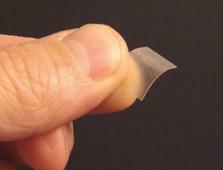 You can pull back on the pad of the finger tip a bit while applying the glue to keep from gluing it to your nail. Use light to medium pressure while holding down the nail. The glue will "wick" in behind the nail, and go where it needs to go. For quicker adhesion, you can spray a bit of nail glue dryer after initially applying the nail at this step. Angle the spray so that it gets under the nail. Spray for 1 second. 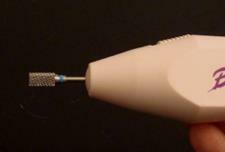 When using a pipette, squeeze it so that a very small amount of glue forms at the tip, then dispense. This will aid in the dispensing and keep the pipette from clogging when using nail glue dryer. 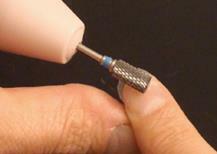 You should dispense the glue at the corners of the nail, where there is not as much gap as the middle of the nail. TIP: If you apply too much glue, it can wick under the nail on the sides and get on your skin beneath the nail. Keep an eye out for this, if it occurs, you can use a manicure stick or your finger on your free hand to wipe it away. 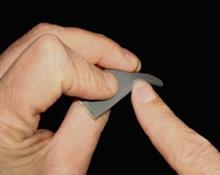 Do so as soon as you can, or you will glue the top edge of your finger pad to your nail. If that occurs, just separate as soon as possible. Also, when first holding down the nail, you can hold and let go a couple of times at first to make sure you're not gluing your fingers or thumb to the nail. Twist your finger or thumb a bit at first before you lift. If you do glue your finger, twist first then pull off. If it's already set and difficult to remove, you can use soap and warm water, or nail polish remover with acetone if needed. When applying a thumb nail, make sure that you have a good "left corner". You can actually apply it so that it slightly covers a bit more left edge. This gives you a bit more nail to work with as you file and customize your tone. TIP: If you have any slight gap underneath at the front of the nail, You can cut the tip of a pipette with nail clippers at a bit of an angle, like a syringe needle, then apply a small amount of glue underneath the nail where the tip of the natural nail meets the Instant Nail. Make sure there's glue in the stem of the pipette, then apply a very small amount of thin nail glue to seal any gap. If you get any excess glue under the nail, you can clean it up in a few seconds with a rotary nail file and an under the nail bit. If you don't have a rotary file, use the end of an emery board file. Use some mild nail glue dryer to quickly seal and dry the glue. This is a highly recommended step, as the nail glue dryer will instantly seal the nail at the seam and hold it in place. If you're not using nail glue dryer at this point, wait about 4 or 5 minutes before going on to the next step. Pre-formed nails need only about a minute. If you do use the dryer you can proceed right away. If any other part of the nail was missed, you can glue it down now. At this point, you can do a rough trim of the Instant Nail tip. You want to leave it a bit long for shaping and filing that you'll be doing a bit later. Trim any excess material that's up off the back of the nail. 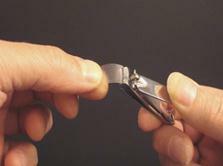 Get in behind the nail with some clippers, and remove as much of the nail that isn't glued down as you can. Next, you're going to taper the Instant Nail into your natural nail plate. A course or medium grit emery board type file works well to start. Then you can finish with lighter grits. With a rotary file you can monitor your filing as you're doing so. You can precisely taper the entire nail very quickly. (Note how the left thumb is used to stabalize the file). It will take longer with a manual file, but with a little patience you can do a good job. If tapering with an emery board type file, it's best to leave the border edge a bit higher than flush, then add a little nail glue, or a thicker brush on nail glue or resin to finish the taper. 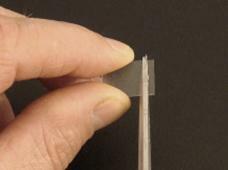 When finished tapering, using the pipette, add a bit more thin glue along the border area you just tapered. This will further make sure the nail is sealed. Always make sure that the nail is sealed at the border where the Instant Nail meets the natural nail. Next, spray with a bit more nail glue dryer. Use some 1500 grit sandpaper to finish. The end result is a perfectly smooth, tapered nail. At this point, you can file and shape the Instant Nail to your preference, taper underneath if needed (see Step 31) and you're done. Fiberglass wrap is used to add a bit more strength and rigidity to the nail. Wrap is also used as a tool for customizing tone. This is a matter of personal preference whether to use wrap or not. It depends on which GuitarPlayerNail you're using, your individual playing style, and tone preferences. When using wrap, cut yourself a piece the length of, and a bit wider than the nail. If you want to reinforce just the tip of the nail, you can cut a narrow strip of wrap and apply it just to the tip of the nail. This will allow more flexibility, and more high end to the tone of the nail. Our wrap is self-adhering. Simply peel off and adhere it to the top of the nail. Trim the wrap all around so that it's the same shape as the nail. Using nail clippers works well for removing excess wrap. You don't have to be perfect, get as close as you can. You can leave the excess wrap on before applying the glue, and then trim off the excess with nail clippers after the glue has been applied. Apply some nail glue to the wrap. You want to apply enough glue to cover the fibers of the wrap completely, but not so much as to pool. TIP: If you are in a hurry, you can use nail glue without wrap. Apply 1 or 2 coats, using nail glue dryer after each coat. Application time is about 15, 20 seconds. Not quite as accurate or durable as with the wrap, but a very quick way to strengthen or repair. Spray a little mild nail glue dryer, or let it dry on its own. The wrap usually dries pretty quickly on its own, but much faster with the dryer.. Then smooth and finish the top of the nail with a fine file and/or some 1500 grit sandpaper. File the nail from underneath with a rotary nail file. 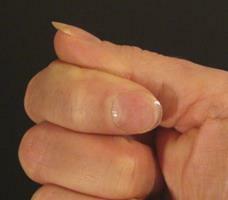 Using an under the nail bit, remove any excess natural nail or glue that is under the nail. If you don't have a rotary file, the end of an emery board type file will work. Best results with a rotary file. Just lightly file under the nail to remove excess material. You can also use the end of a fine grit emery board type file and some 1500 grit sandpaper folded a couple of times with a curve to finish underneath the nail. The nail will sound great immediately. However, as the glue cures, it will develop a bit more rigidity and brightness to the tone. The end result is a durable, great sounding nail that feels like your own. It's also a nail you don't have to worry about. If something happens to it, you can remove it and apply another one in a few minutes. 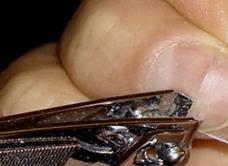 A very quick and accurate way to remove our nails is to file them off. 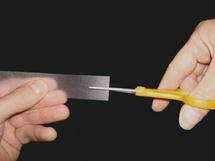 It takes about a minute with a rotary nail file, you can remove our pre-formed nails very quickly. Emery board files also will work, but take longer and are not quite as accurate. Simply clip off the tip of the nail and then file the rest of it off. 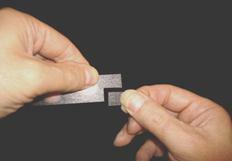 When filing off a nail, friction can build up, so keep the bit or file moving to different areas of the nail. You can leave a thin layer of the old nail on if you wish. Take your time and use good lighting. Our pre-formed nails can be soaked off with acetone, (nail polish remover), but it's much faster and easier to file them off too. Since you've only applied the GuitarPlayerNail to only 1/2 to 3/4 of the nail plate, you can use the border of the nail as basic reference as to how much nail to file off. Also, if you watch carefully while you're filing, you'll be able to see where the GuitarPlayerNail ends and the natural nail begins. View from above and from the side of the nail. If you remove any natural nail while filing, you should build up the nail before applying a new Nail. This procedure only takes a few seconds. If there is any sensitivity in the nail, build it up a bit. Best way to build up a nail is to apply some brush on nail glue (or any viscous nail glue) and then spray with some nail glue dryer. If you use a thinner nail glue, apply thin layers at a time, as it will build up more heat when using nail glue dryer than more viscous nail glues. Please buff the nail lightly before applying a new nail so that the nail glue dryer won't continue to work. If you don't, the glue will dry too fast when you go to apply the new nail. If you have any questions, or if any problems arise, don't hesitate to contact us! There is a learning curve with applying our nails. If you run into any problems at all, please contact us. We have lots of experience with any situations that might occur. If you don't achieve the exact tone and performance that you want from our nails, give us a call; 209-295-4969 or e-mail us. We'll make sure you do. We also have Skype. We'd be glad to show you any aspect of our application. Our nails are applied with the use of fingernail glue. If you have any allergies to fingernail glue, consult a physician before using. If you have any medical conditions or problems with your fingernails, consult a physician before using any artificial fingernail. If any irritation occurs while using this product, discontinue use and consult a physician.